Before my gluten-free days, I held the esteemed post among my friends as the Queen of Crostini. (Flip your copy of In the Small Kitchen to page 93). But nowadays, since I’m forced to make bread-y delicacies for my clients on a bi-weekly basis, I try to only serve things to my friends that I can actually eat. 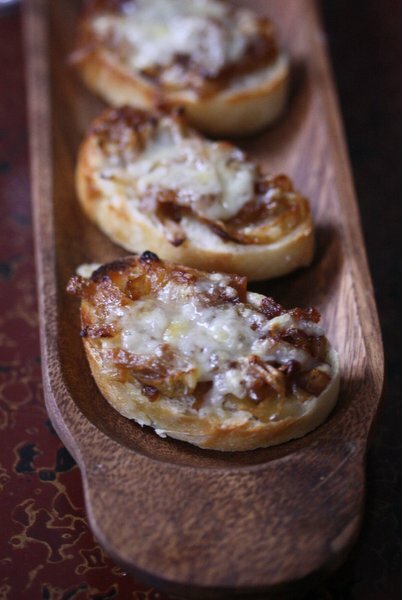 The recent exception, of course, were these French Onion Crostini. Earlier this month I got a really cool, and semi-masochistic, recipe development job creating new grilled cheese sandwiches for La Brea Bakery. It’s hard enough to test these recipes without inhaling each and every sandwich – especially since they evolved from my conception of what would be the most delicious grilled cheese in the history of sandwiches. But to add insult to tummy injury, I was sent not one or two or three loaves of bread to play with, but 18. Now, I have a pretty large fridge for Manhattan standards. But not even the most experienced iPhone tetris player could have fit all that bread in my freezer. I ended up hosting a few dinner parties to pawn all the cheese and bread off on my friends. (You can see delicious La Brea Foccacia pictured here.) Of all the loaves, the baguettes were hardest to squeeze into my freezer. 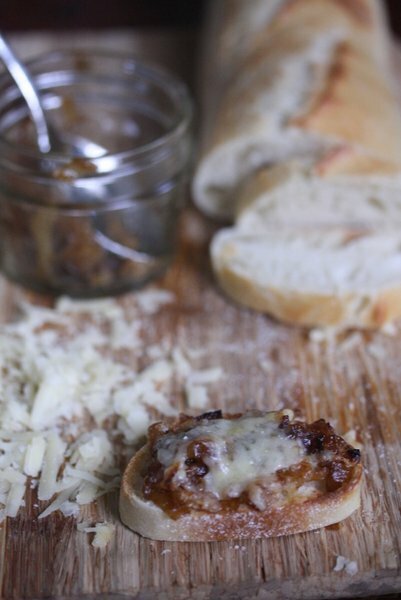 So I repurposed the makings of my French Onion Grilled Cheese into these cute little appetizer-sized crostini. This past weekend, I cozy-ed up with my copy of the Smitten Kitchen Cookbook and spent a good hour post-it noting the recipes I wanted to try. 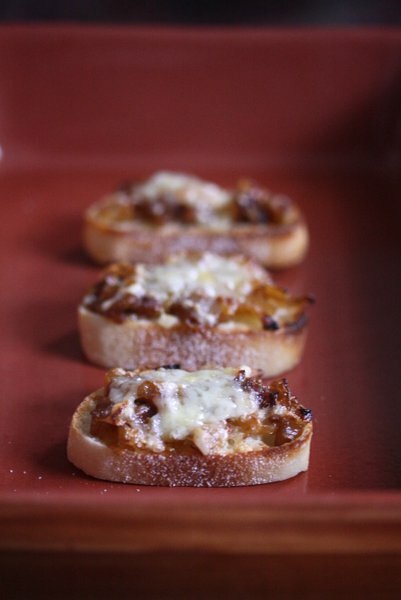 Eventually in the last chapter, I discovered Deb’s version of French Onion Crostini. Great minds! She developed the soup flavor in her onion mixture by adding beef stock, while I just used plain Jane caramelized onions. If you’re not serving vegetarians, give her recipe a looksy. Otherwise, if you want the easy pedestrian version, I encourage you to try the below. 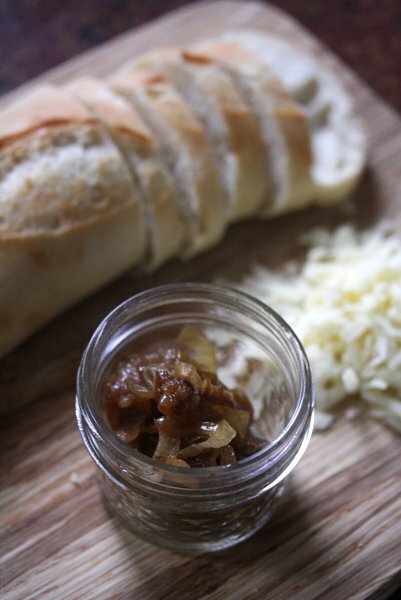 There may be no more tedious kitchen task than slowly caramelizing onions. But there’s also probably no result more delicious than these sweet, nutty, cheesy fruits of your labor. I’ll be sharing more recipes (like this one) from the La Brea experiment in the coming weeks! Place the whole baguette on the sheet pan. Bake in the oven for 5 minutes, until hard and crusty. Remove to a cutting board to cool. 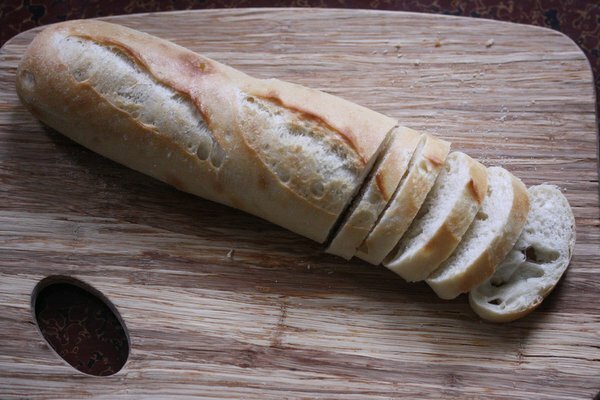 Once cool enough to handle, thinly slice the baguette into rounds. Arrange on the baking sheet. 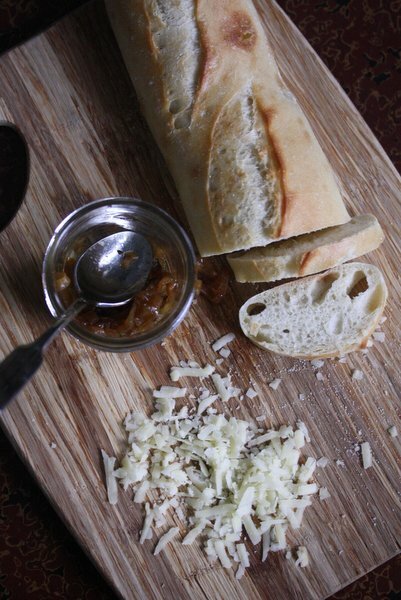 Slather each piece of bread with about 1 teaspoon of the onions, and mound 1-2 teaspoons of cheese on top, depending on the size of your baguette. You want a good layer of onions and a sizable mound of cheese. Place the baking sheet under the broiler until the cheese is bubbling and beginning to brown, about 3 to 5 minutes. Allow the crostini to cool slightly on the sheet. Arrange the crostini on platters and serve warm. Coat a large cast iron skillet with the olive oil and sauté the onions over medium heat, stirring very infrequently. Once they soften and begin to brown, reduce the heat to low. Caramelize slowly, stirring occasionally until deeply brown and very soft, about 40 minutes. Store in an airtight container for use in omelets, toast, and anything else you want to make infinitely more delicious. This is the perfect recipe for winter, snowed in with boyfriend, which I am. Luckily we stocked up beforehand. 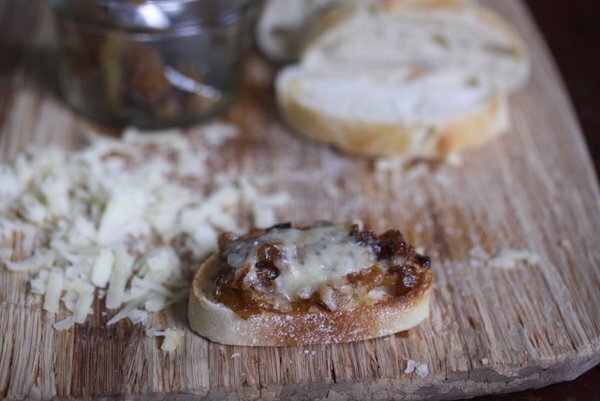 If we’d had this recipe we could have stored the bread in the freezer, and the cheese and onions keep indefinitely – so we could’ve been here for a week and been happy. Unfortunately we just got plowed out. But I’m going to try this anyway. BTW, tried your butternut squash paella – outstanding! The smoked paprika made all the difference. Thank you! this looks so delicious, Phoebe! what a wonderful winter alternative to take the place of our long-gone, bread-topping tomatoes. yum! hooray!! can’t wait to hear how you like them. thanks for stopping by, Diana!